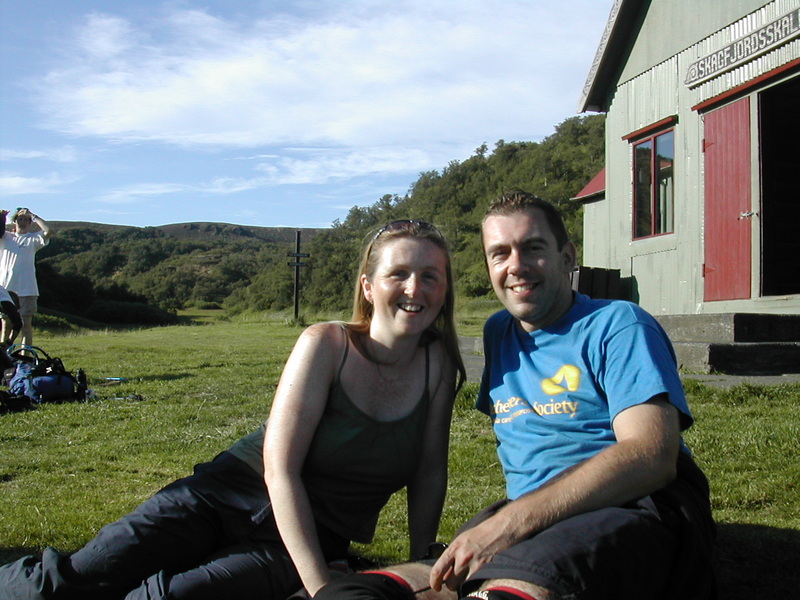 In the late summer of 2004 Julia and I decided to do something active to raise money for charity. 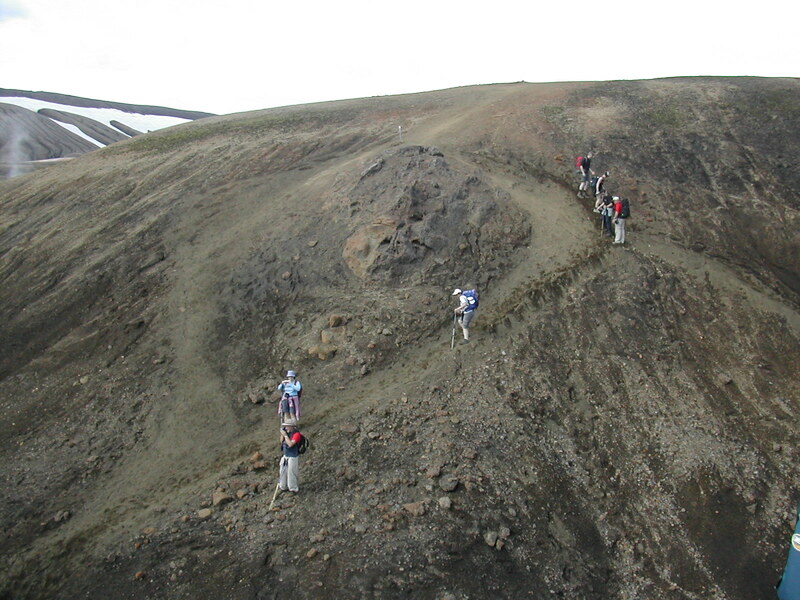 We discovered a number of treks on the Charity Challenge website and opted for the Long Weekend Lava Trek in Iceland. Our chosen charity was The Alzheimer’s Society. 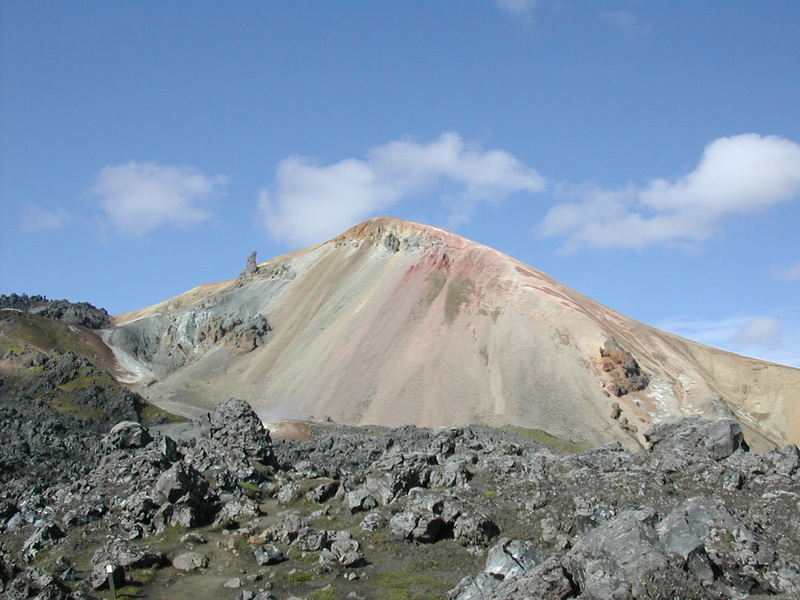 Colourful rhyolite mountain. Our first ascent of the trek was just to the right of the green area. Looks easy from here, eh? Actually, it wasn’t too bad. Must have been all the training we did. Looking back over the ground we have covered so far. 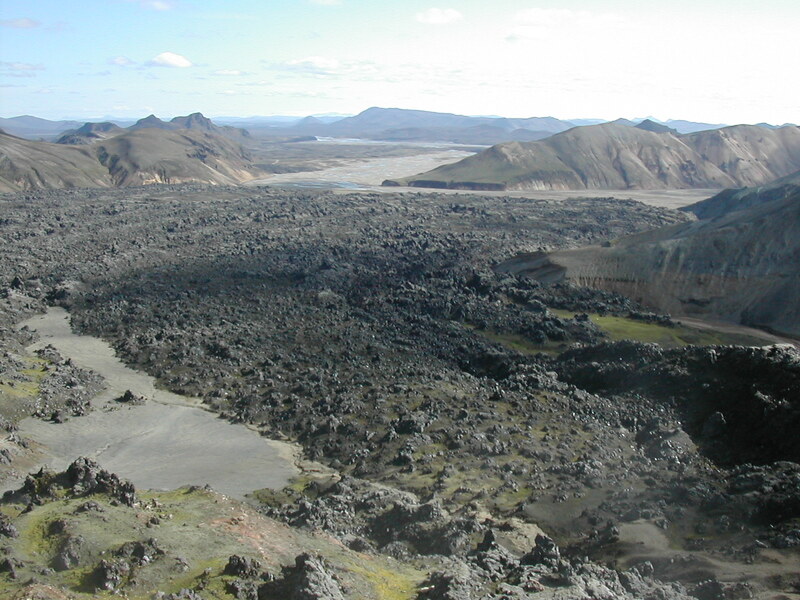 Here you can see Laugahraun lava flow fanning out into the distance. Just over the far edge of the lava flow, out of sight, is the rhyolite mountain in the previous image. 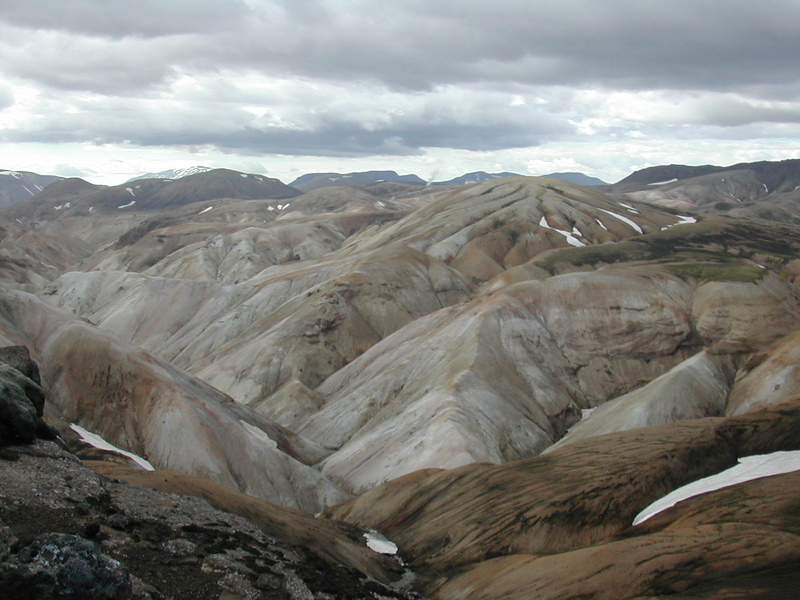 The plain that you can see, beyond the lava, is Landmannalaugar camp, where we started our trek. A smelly, boiling hot, pool of water at Stórihver. Not the sort that you relax in. Just another reminder of how volcanically active Iceland still is. The smell of sulphur here was very strong, though the local flora didn’t seem to mind too much. The landscape here was scattered with such pools and water-spitting vents. Just to prove that this was no walk in the park, this is one of the many steep descents that we had to make. This is why I wore two knee supports and used a trekking pole. Quite often we would have to descend in this manner, cross a stream of melt-water and then ascend an equally steep slope. The paths were far from permanent and we often found ourselves kicking into the side of a slope to get a foothold. Everyone who has seen this photo has been taken back by how smooth these rhyolite hills are. 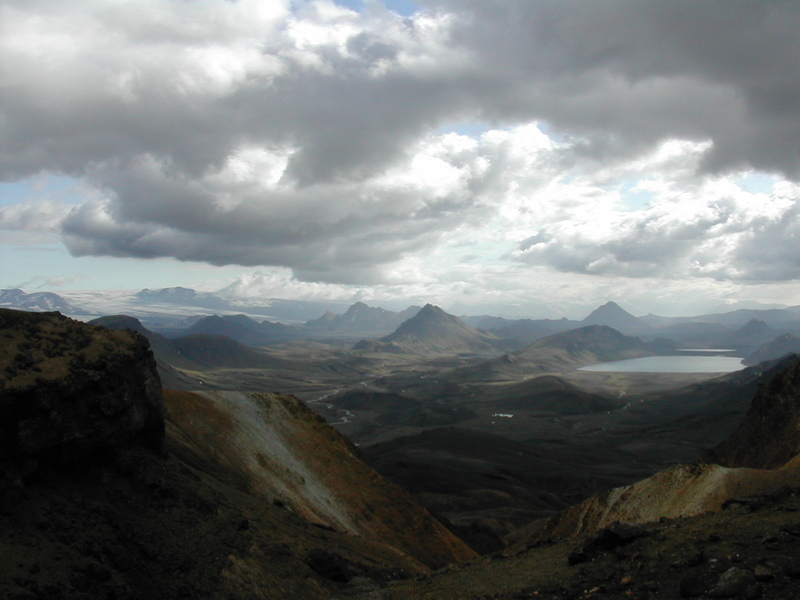 This, along with the next image, show how diverse the Icelandic landscape can be. This photo does not stand out that much for me; however, I do remember being impressed with this landscape at the time. I guess you’ve just got to see it for yourselves, folks! Jökultunga Ridge. This was the scene that stole the show for me. I couldn’t get enough photos of this landscape. In the foreground; black-red sand. Straight ahead; lush, green peaks surrounding Lake Álftavatn. 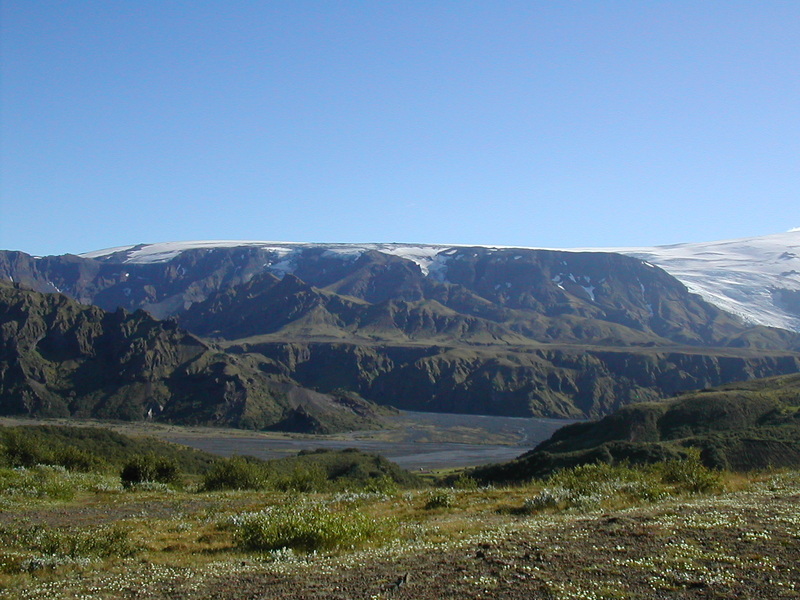 Left Horizon; Mýrdalsjökull icefield. Above: they’re clouds (available from a window near you now. UK only) – a welcome break from the heat of the sun. Unfortunately, this image does not show just how green the landscape was. Lord of the Rings, anyone? 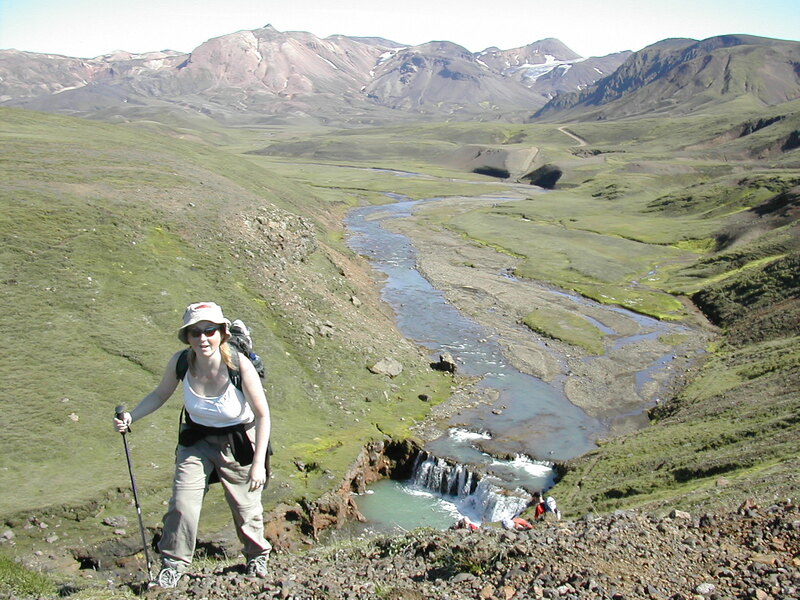 The Álftavatn Valley contained more steep descents, river wading/jumping/bridging and steep ascents. Look up, Julia. Julia…JULIA, look up. Click. Gotcha! We found the trek easier when we were near the front of the group as we were able to keep pace with Stephan, one of the guides. This also allowed more time to take photos, dropping back if necessary. We had trained quite hard, expecting to be near the back all the time, thus adding to psychological pressure. However, this was not the case at all. Furthermore, the guides mentioned, on several occasions, that the group as a whole made good time between stops, with little time difference between the faster and slower members of the group. In no way was it a race, but the trek was made easier by having the ability to walk at our natural pace. River heading west towards Storasula. Images of Storasula where the peak hasn’t been chopped off. 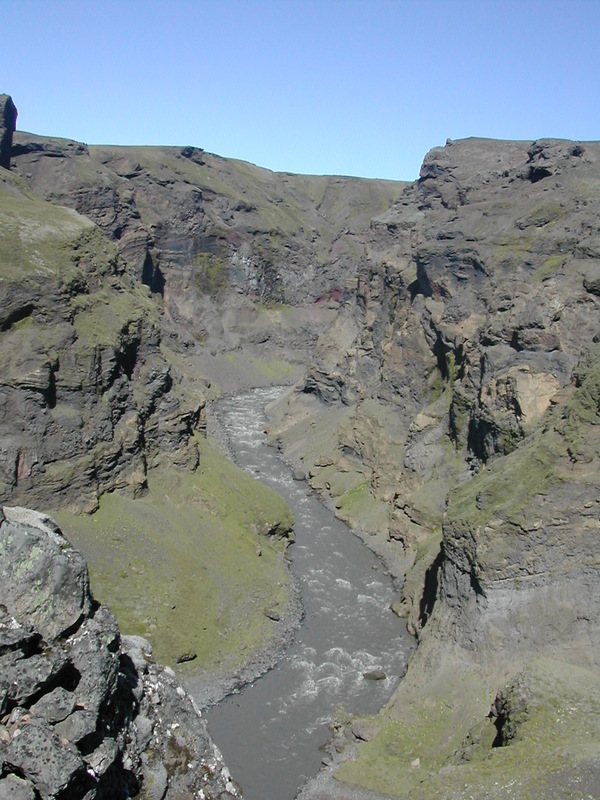 Markarfljót Gorge. So far the journey had been devoid of wildlife, bar the odd sheep deposited by a farmer – here we saw some birds (flying mammals, not women!) enjoying the cliffs or whatever it is that birds do. Ah, the end is in sight! 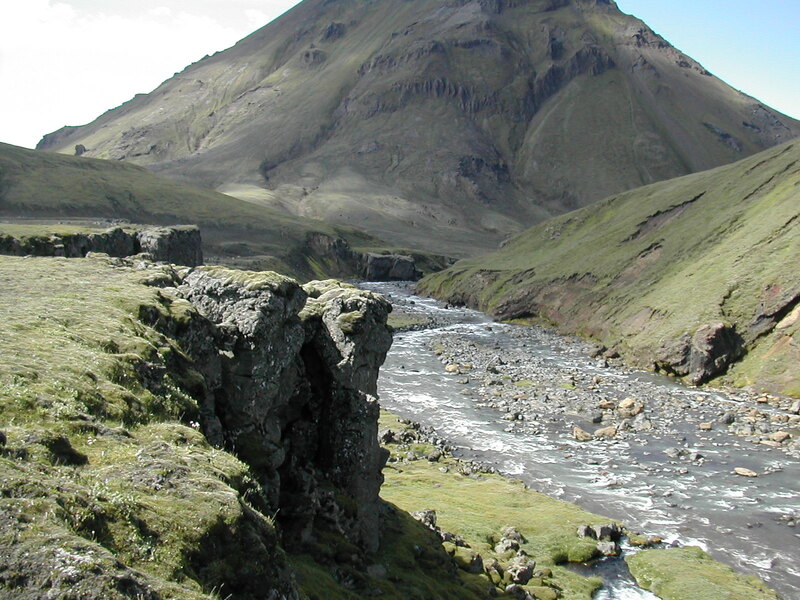 That white dot just this side of the river is Þorsmörk Hut. As ever, Mýrdalsjökull icefield in the distance. Cheesy grins. We’ve finished! Except that, after we’d bought a celebratory can of beer, we had to walk a further kilometre, across some treacherous ground, to the bus. Boo! 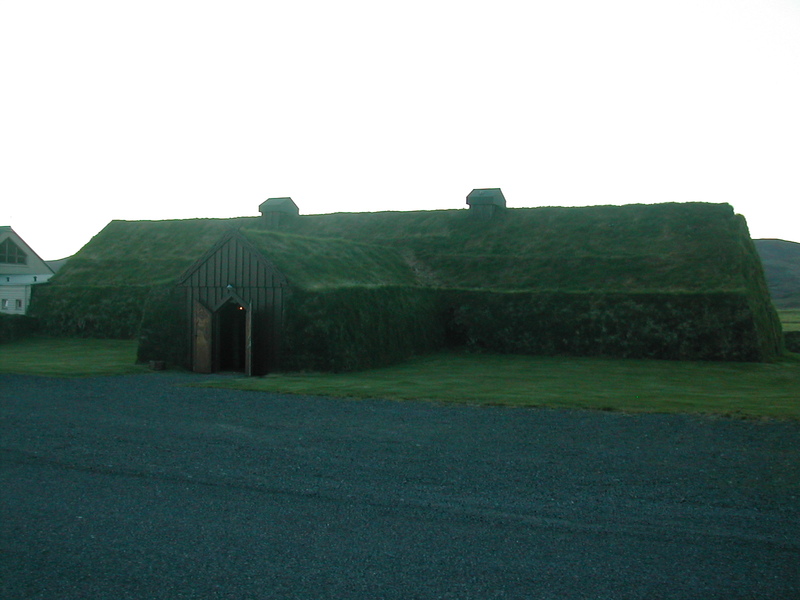 On our way back to Reykjavik, we stopped off at this Viking restaurant (name unknown). Apparently, it was the only place willing to accept 40-odd smelly trekkers. There were no other customers, but we weren’t going to complain; we had pints of beer for £5 and a bottle of Chilean chardonnay for £34. Costly, but well deserved. Skal!